Served by the Kintetsu Railway and West Japan Railway (JR West), most of Nara's regions can be accessed with ease by train. An extensive bus network operated by Nara Kotsu is also in place for access to more rural areas, and as an alternative to rail travel. Nara City attractions are spread out across three main areas: Nara Park, Naramachi and Nishinokyo. An extensive citywide bus network connects the areas and their sights. Although Asuka is easily reached by train from Nara City, the area's sights are fairly spread out and sometimes far from the station. Make use of the local bus routes to cover the most ground. 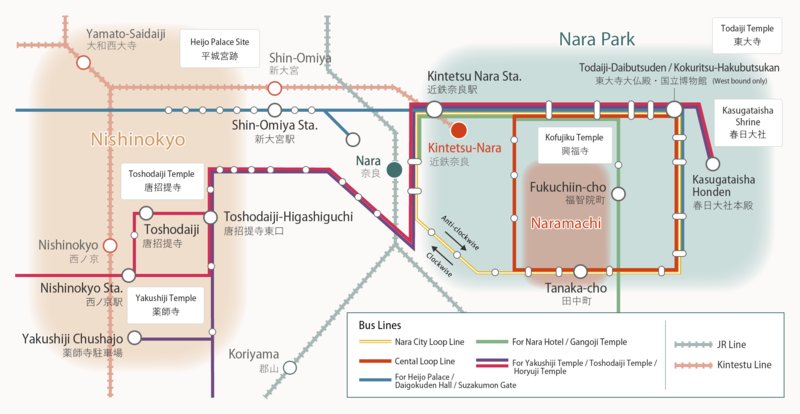 The Horyuji area is a short train ride from Nara Station, but also well-served by buses departing from Nara Park. Many of these also make stops in Nishinokyo and Yamato Koriyama. The Kintetsu Railway and West Japan Railway (JR West) operate rail service throughout Nara. Both network operators offer money-saving passes to overseas visitors, making rail travel an affordable and convenient option. 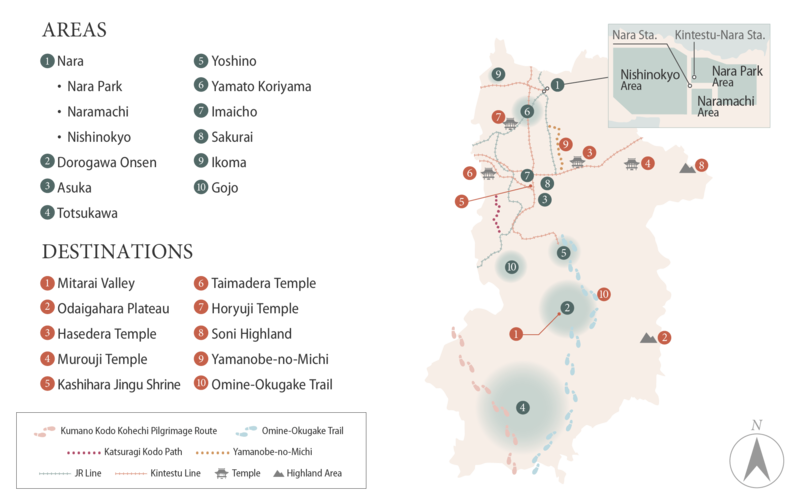 An overview of the different passes covering travel to and within Nara can be found on the Travel to Nara page. Nara Kotsu operates the prefecture's extensive bus network, making it possible to travel to many of the more remote areas not served by rail. They also run many tourist-friendly bus routes linking the key attractions in Nara City, and in other popular areas like Asuka. For affordable pay-as-you-go travel within the city, look out for the red and blue Gurutto buses: fares are just ¥100 per trip. Alternatively, pick up one of the inexpensive money-saving bus passes below, covering travel to areas as far as Murou and Sakurai. Entitles the bearer to discounts and special services at 42 restaurants and shops within the area. If deciding where to go and figuring out timetables is not your thing, you may want to put your feet up and book onto one of the sightseeing tours offered by Nara Kotsu or Nara Visitor Center & Inn. Taxis provide a convenient alternative to travel by bus, especially in more remote areas where bus services from train stations to key attractions can be infrequent. In such areas, it is worth noting that taxis generally cannot be hailed and are only available from ranks outside train stations. Calling to order a taxi is possible but you may need help from a local to explain your location in Japanese. Taxis are more readily available within Nara City and can sometimes be hailed at peak times during the day. Those around Nara Park, however, can only be caught from designated taxi ranks along the edge of the park. When struggling to flag a taxi in the city, head to one of the stands at the park or outside either JR Nara Station or Kintetsu-Nara Station. With numerous businesses and tourist information facilities offering bicycle rental services throughout Nara, cycling can be an exciting and more active alternative to travel by bus and train. In addition to regular bicycles many outlets offer battery-powered bicycles, which make hills a breeze. It is also worth noting that certain rental locations allow for bicycles to be returned at partner locations elsewhere. For more information on rental locations throughout Nara, click on one of the areas in the list.